Agreed, this information is not overly useful. These hacks are basically on the opposite end of the threat scale from the over-hyped "Advanced Persistent Threat" (APT). Let's call it the "Basic Sporadic Annoyance" (BSA), just to come up with a new acronym :). 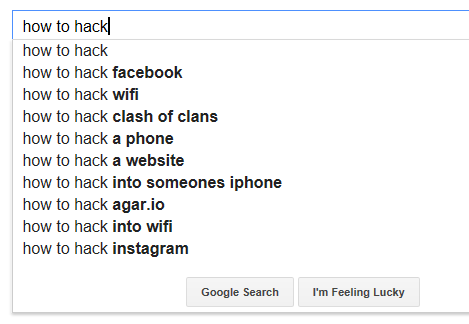 The BSAs still tell us though what "average" wannabe hackers seem to be interested in breaking into, namely: websites, online games, wifi and phones. Cars, pacemakers, fridges and power plants are not on the list, suggesting that these targets are apparently not yet "popular" enough. Over in the SANS ISC discussion forum, a couple of readers have started a good discussion https://isc.sans.edu/forums/Encryption+at+rest+what+am+I+missing/959 about which threats we actually aim to mitigate if we follow the HIPAA/HITECH (and other) recommendations to encrypt "data at rest" that is stored on a server in a data center. Yes, it helps against outright theft of the physical server, but - like many recent prominent data breaches suggest - it doesn't help all that much if the attacker comes in over the network and has acquired admin privileges, or if the attack exploits a SQL injection vulnerability in a web application. There are types of encryption (mainly field or file level) that also can help against these eventualities, but they are usually more complicated and expensive, and not often applied. If you are interested in "data at rest" encryption for servers, please join the mentioned discussion in the Forum. 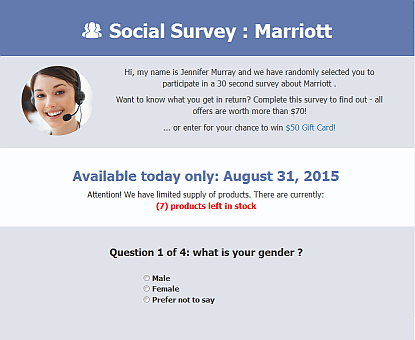 ALERT: Your Marriott-Gift Card will expire 09/15/15. .review ? How lovely! Let's use the opportunity to again *thank* ICANN for their moronic money grab, and all the shiny new useless "top level domains" that honest users and corporations now have to avoid and block. The lesson learned a couple years ago, when ".biz" and ".info" came online, should have been enough to know that the new cyber real estate would primarily get occupied by crooks. But here we are. I guess ICANN and most domain name pimps don't mind where their revenue stream comes from. But I digress. Clicking on the link results in a rather unimaginative website, hosted on http://lucky-survey.com-hu3[dot]info, shown on the picture below.